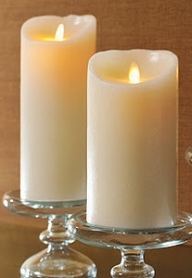 Home > Lighting > Candle Holders > SALE! 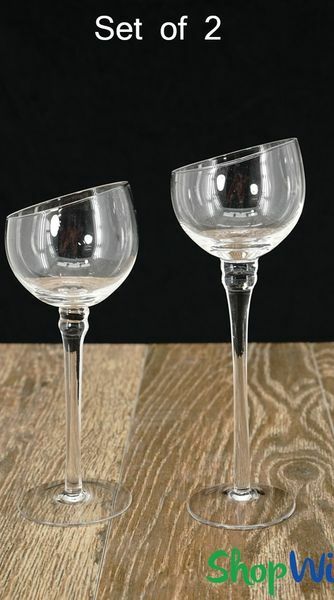 Tall Bias Cut Glass Candle Holders - Set of 2 - Long Stem - 8" & 9"
SALE! Tall Bias Cut Glass Candle Holders - Set of 2 - Long Stem - 8" & 9"
Vase - Half Moon Bias Slant Cut Clear Glass - 15 3/4"
The distinctive cut on this set of 2 Clear Glass Candle Holders is sure to add interest and energy to any tablescape! The graceful curved opening is elegant and sophisticated and this is one centerpiece you can easily dress to match your theme whether your event is contemporary, rustic, grandiose or simple. These half-moon design candle holders are 8" tall and 9" tall and the angled opening is slightly oval and measures 2 7/8" long by 2 3/4" wide with a depth of 2" (the frontmost point). Floating our Single Foam Roses creates an elegant look as does using a Waterproof LED Tea Light Candle. 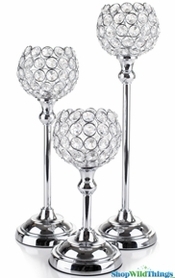 Trying to create a fresh new look isn't always easy so starting with classy decor pieces like these elegant long stem candle holder instantly creates a unique centerpiece design. The height variation creates a wonder visual impact while the height is low enough for guests to see over. 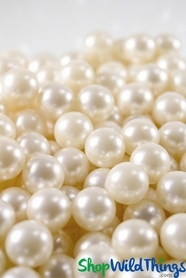 Combine with identical Sets of 3 Bias Candle Holders to dreate one long centerpiece down the length of dessert or reception tables and fill with Pearls, Diamond Confetti , rose petals or colored sand. Use on top of mirrors or tie in the colors of your event by attaching a silk ribbon around the stem or by submersing waterproof LED lights in water pearl jelly decor. The half cut slanted cups sitting atop crystal clear stems make any table look upscale and the clean, sleek style is always refreshing, always fashionable! These are hand-blown glass candle holders which means that no 2 pieces are identical and minor imperfections like tiny bubbles may be visible. It is not machine made but one of a kind! All of our glass products except where indicated, are 100% hand-blown. This means humans were involved during the production process. For this reason no 2 pieces of the same product would be identical. The measurements will be very close to the descriptions given with possible slight variances. Thank-you for understanding.